5) the dark abyss just under the shelf. There are more than five of course, (like the neighbor’s world through those darkened windows in the upper, right hand corner) but you get the gist. 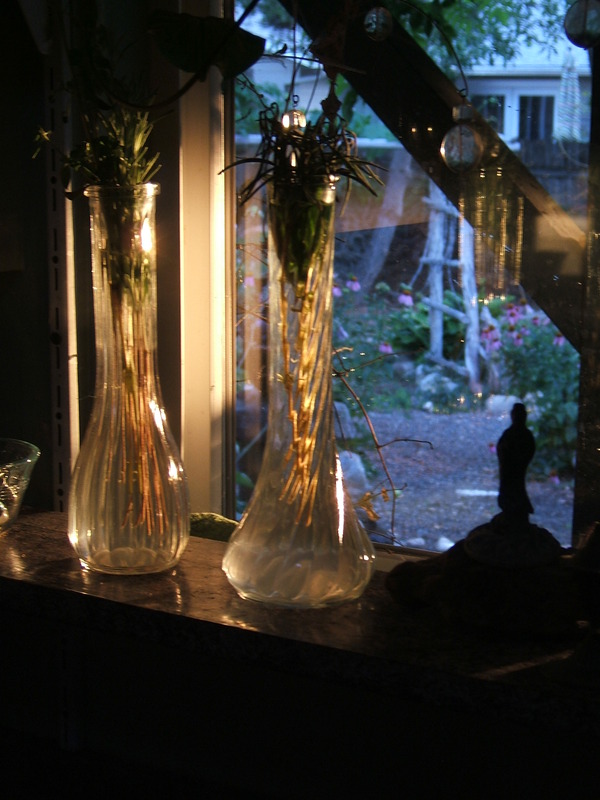 Without the camera I only perceived a single world with the vases as its dominant focal point. All the other unique, fascinating worlds present were reduced to background noise, like visual mall music. It took the camera to give me the time and mental shift necessary to see the rest. I realize our brains are designed to take the overwhelming barrage of sensory detail that batters us at every moment, and filter it down to just one or two things that we can actually focus on. And this ability is a good thing. I understand that. Without it we’d all have Asperger’s. But it also means that this seemingly solid, worthy, dependable world we put so much stock in is actually made up of layers upon layers of different realities, entire alternate worlds in fact, most of which we completely miss, all the time. Our perception of everything around us isn’t even real. Or no…it’s real enough taken by itself I guess, but it’s only a teeny tiny sliver of what’s really real. It’s like what the poor sun had to do to itself to make it all the way inside our kitchen window: Reduce an entire star’s massive energy field–immense enough to warm and light an entire solar system–into a low spectrum sunbeam, roughly 2 foot by 3 foot, that only lasted for a minute and a half. Talk about partial. Having said all that though, still. The illuminated vases were very…very…cool, and I guess that’s enough. Sometimes, the slivers alone will knock your socks off. You astound me with your insight. It is interesting that you mention that our worlds are in fact a set of innumerable alternate realities — worlds, if you will. Interesting because even though it has been mentioned countless times before, most of us never really perceive their existence. To filter, or not filter is a subsequent matter, but to not know is another.